Founded in 2001, the rescue has grown to handle incoming dogs from New Mexico, Texas and Arizona. Thanks to the working relationships they’ve cultivated with other shelters and rescue groups in this tri-state area, they are able to locate and save dogs according to their breed-specific mission. For example, last year when a massive hoarding situation was uncovered by law enforcement in Tomball, TX, SW Collie Rescue helped with the intake (147 collies were saved). Completely staffed by volunteers, the daily operations are overseen by regional coordinators based on the goals laid out by the Board of Directors. In the early years, they rescued approximately 25 dogs per year. That number has more than tripled. To date, they have rescued well over 700 collies and shelties! Upon intake, every dog receives a wellness exam, inoculations, immediate treatment of wounds and illnesses, and much more. As soon as a pup enters their system, they can rest assured that they will be taken care of. Healthy dogs usually spend less than a month in foster care, as SWCR works diligently to place adoptables in loving homes. As you will soon see, unfortunately not all of their dogs are healthy when they are saved. While behavioral issues with these breeds are rare, some come from backgrounds where little to no socialization has taken place. Or, worse,from an abusive situation. 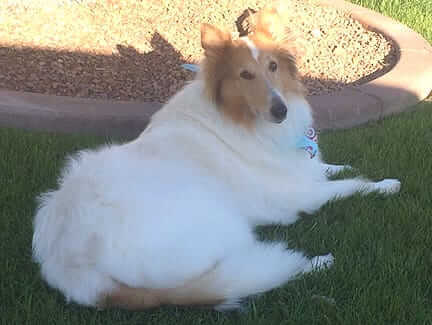 Thanks to a committed network of experienced collie and sheltie foster parents, every dog finds himself in an environment of love, patience and training. It’s all part of the package, readying these creatures for their eventual adoption. If any behavioral issues are noted, the expertise of an animal behaviorist is employed. No pup will leave foster care before they are ready to join a loving household. SW Collie Rescue used their financial award to help cover the costs of veterinary care for three of their dogs who had urgent needs. Given the quality of their care, and their outstanding dedication to their cause, the Board’s choice to fund their application was an easy decision. Shasta, age 7 or 8, was found as a stray in the desert outside El Paso, TX. She was covered with ticks. Her filthy, matted coat hung like dreadlocks from her emaciated body. She also had large mammary tumors, one the size of a grapefruit and weeping clear fluid. She underwent successful surgeries for three of these tumors in New Mexico. After her recovery, she was driven to Phoenix, AZ to be fostered by a family interested in adopting her. There, a fourth tumor grew quickly. Not all of it could be surgically excised and complications ensued. But the tumor was benign, so her caretakers are hopeful that this sweet, beautiful girl will recover fully. 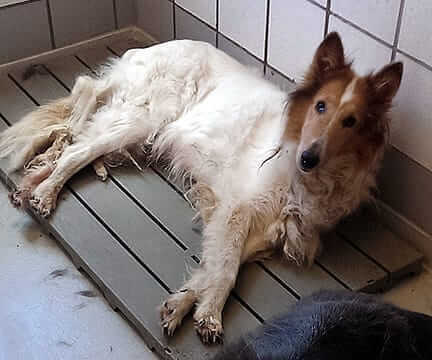 Cassidy, age 5, was one of collies rescued last year from the hoarder in Tomball, TX. She had given birth to many litters in unspeakably squalid conditions. Once rescued, she was treated for hookworms and spayed. 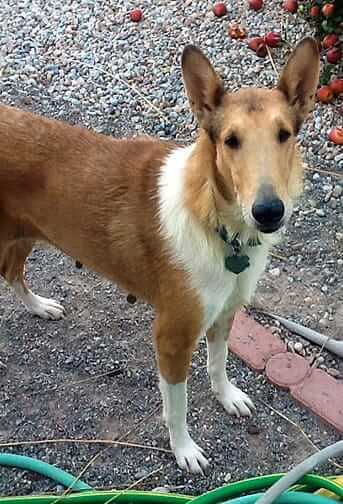 She seemed healthy and soon became a happy, loving house dog at her foster home near Albuquerque, NM. A month later, Cassidy suddenly stopped eating and was in such pain that she could barely move. She had a fever, swollen joints, a high white blood cell count and a low platelet count. It was clear to everyone, Cassidy was going downhill fast. Caretakers rushed her to an internal medicine specialist, who ran more tests and diagnosed her with immune-mediated polyarthritis (IMPA), an autoimmune disease. Cassidy improved immediately and went home, but every time her drug dosage was reduced she would relapse. Then, four months later, she was overwhelmed with even more problems, causing another rush to the specialist and yet another close call. She now is suspected of having systemic inflammatory response syndrome (SIRS), a condition in which multiple inflammatory pathways are activated, causing a widespread attack by the different parts of the immune system against its own cells and tissues. Since SIRS can be fatal, managing it requires constant attention to symptoms and skillful balancing of drugs and dosages. Cassidy’s foster mom, who loves her dearly, provides the attention this poor creature requires. They remain hopeful that they can provide the care needed for Cassidy to continue her journey of healing. Faith, age 2, was spotted lying motionless in the desert outside Las Cruces, NM. But she was still alive, though dehydrated and nearly starved to death. When she was taken to the local shelter, she was too weak to eat or stand. Shelter workers there took good care of her and contacted SWCR, asking if it would be possible to accept her into foster care. Most of Faith's coat had fallen out, so it was difficult to discern her breed. But it didn’t matter. After one look, SWCR volunteers could not refuse this sweet, timid girl, who had cheated death and suffered so greatly. Thanks to excellent vet care, good food and dietary supplements, Faith soon was taking walks, playing with the cat at her foster home, and running with energy and confidence. Weeks later, she has made a full recovery and now is ready to be adopted by a forever family. Anyone looking for more information about this incredible rescue, or the dogs currently available for adoption, can visit their site at nmcollierescue.com. I LOVE knowing that feeding my pets Life's Abundance helps other, less fortunate animals get the care and love they need to find their forever homes. Thank you Dr. Jane Foundation! Look at the great work this rescue group is doing! And look at what every one of the purchases through Life’s Abundance helps to support! Virgil and I are very proud to be associated with a company that takes rescue so seriously! Thank you for supporting this rescue. We adopted our collie from them 3+ years ago, and we occasionally drive dogs and participate in fund-raising events. Wonderful group of people and beautiful breed! I have always admired the noble beauty of this breed. Congratulations to this rescue for helping those in need, and thank you to the Dr. Jane Foundation for your support. my wife and I since we are on ours late and mid 70's. Keep the good job SW collie rescue. Oh my goodness. The before and after picture!!! So amazing. This is one of the reasons that I'm part of this company. To see how we are all working towards the greater good of the health of all the animals. We have owned (or should I say the collies owned us) for over 40 years and recently added to our home the mini Aussie. After reading about what you do for rescues, I am so glad that we buy your products. I can't imagine a world without collies or Aussies and thanks to you all of our dogs are very healthy. Keep doing what you do and I am so happy that we buy quality dog food from your company. Thanks again a very happy customer! it gives me hope that there are people like these rescue groups who go to such lengths to save these poor innocent animals. no matter what breed. I found this internet site and their products and will be starting my two dogs on one soon. I wanted to purchase another product but it was sold out. get with it folks. start production again. your customers are waiting.